I've been searching for a light-weight tweed jacket for a while. My requirements are pretty simple: non-pink version, less than $100 and of course, the fit has to be somewhat perfect. I finally found the perfect one for me where I least expect it - the Esprit outlet! I went shopping with my family last weekend. After walking around a bit, I couldn't find anything that worth buying. I decided to check out the mall directory and see if I've missed out anything. Evidently, I did because I had no idea there's an Esprit store in that outlet mall. I was so excited to find a new place to shop. It must be my lucky day because everything was an additional 70% off that weekend. I asked the SA if they were going to close the store and she said no. They were just trying to clear out their winter stuff before getting new shipments. This jacket was originally $119. It was marked down to $69.99 plus an additional 70% off. I ended up paying $21 for it. This jacket is very well made and fully lined. It's a light-weight jacket so it won't keep you warm during this time of the year. However, it's perfect for spring or fall as a layer piece. This jacket runs super tiny. I couldn't fit into a size 0. I am wearing a size 2 and couldn't have asked for a better fit. The length is great on me and most importantly, well-fitting in the shoulders. Measurements: Shoulder to shoulder: 15", body length: 20", sleeve length: 24"
I also tried on these 2 jackets below but did not get. As for the J.Crew one, it was too expensive for me and the fit was way off. As for the MNG one, the fit was great but I wasn't in love with the color. Wow! 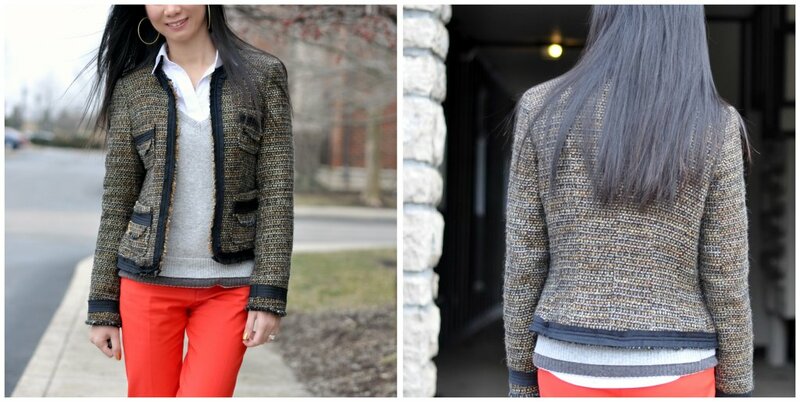 what a great deal on the tweed jacket! It looks expensive and I can see that color being so much more versatile than those pink/red ones. 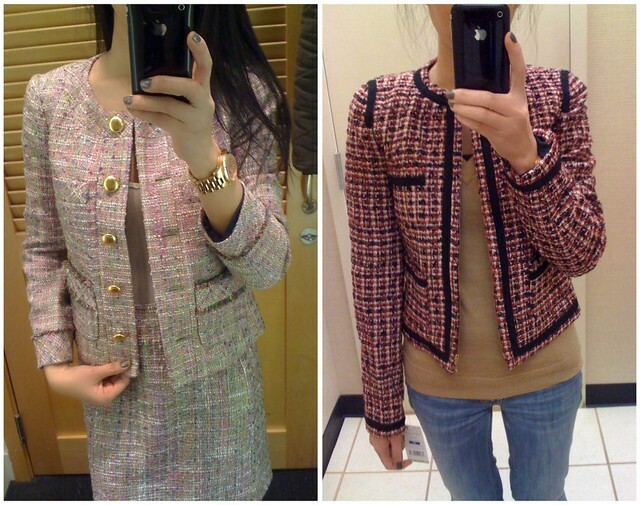 I'm all giddy that you found such a perfect tweed jacket! I'll have to hop by the Esprit near my area! Love those red cropped pants on you! Amazing find!! I love the details of this jacket! It is very flattering on you! Oh wow amazing deal! I like the black trim on the jacket. Looks great on you...no alterations needed and only $21? What a score! That jacket was an amazing deal for $21! It looks very Coco Chanel,. love it! Great Find!! Can't wait to stop by Napa Outlet this Saturday. Hopefully there's some good deals for President's Day weekend. This jacket looks fabulous on you. After Kelly wrote about Esprit, I did pop into a store but didn't have any luck. This is an amazing find as it doesn't look "juniors" at all. I'm so curious to try on the sz 0! ooh mb i will have to go to my esprit outlet and see what sz 0 fits like. thx! Oh my goodness, not only did you get a good deal but you got a beautiful jacket too! It looks perfect on you and now I want to go to the Esprit outlet too :) Is this in Jeffersonville? You really found a gem of a jacket there and at a great price too! Just wanted to say thanks for the pictures of the other jackets you tried on. It definitely helps in the buying process I think when I see how something looks like on a person. $21?!? Wow that's crazy! We have so many Esprits here I think I take it for granted :P They do have some really great sales! The jacket looks great on you Sydney! @- A You're quite welcome. I'm glad that I can help! I didn't even know Esprit was still around. Awesome find and it looks so classy and chic. I'm loving this jacket! So Chanel inspired and the pop of color in the pants is perfect.